Alliance Francaise, B/h Food Corporation of India, Shyamal Cross Roads. BUGNES COOKING WORK-SHOP 6 P.M.
DRUM-CIRCLE 7 P.M. to 8:30 P. M.
Spot -Registrations : 5:30 P. M.
For Reservations, please visit the ALLIANCE FRANCAISE Premises before 24th April’16. 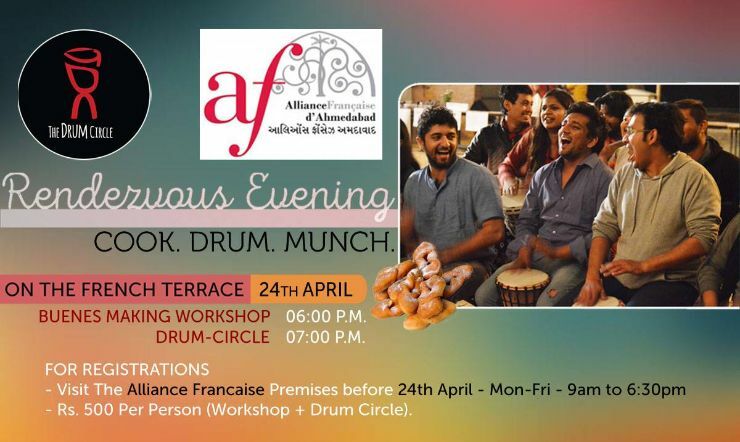 Alliance Française (AF) Ahmedabad & The Drum Circle (TDC) have collaboratively curated a beautiful evening. An evening where participants can take part in Bugnes cooking workshop and also enjoy the drum circle. The Beautifully Decorated French Terrace of AF is where all the drumming will happen.